Nikos Kouroussis was offered a box-like room at the back of the Italian pavilion at the Giardini. The room was in a bad state and half of the ceiling hung very low, which made the set-up even trickier. Despite these conditions and the usual technical difficulties, Kouroussis managed to put together his installation, taking Ulysses’ story as an autobiographical metaphor as well as a poetic allusion to a collective desire for ‘justice and truth’. The central piece consisted of hand-folded paper boats made of glossy Cypriot and Italian magazine pages, oscillating on the tips of fine metallic strings, or piling on top of geometric metal constructions on the floor. A wall arrangement showed 12 photographic views of a Cypriot seascape, next to a video with images and sounds recorded on location. The video equipment got stolen just after the opening, and the installation, like most others in the same space, suffered damage under a thick coat of pigeon droppings. The July-August issue of Italian architecture magazine L’Arca published an article on the biennial where the shows of Anish Kapoor (British pavilion) and Kouroussis featured among four key national representations. Initially, Kouroussis intended to construct 5 large wooden sculptures in the shape of a paper boat and pull them along the Grand Canal, alluding to the historical, cultural and commercial bonds between Cyprus and Venice during the Middle Ages. The wooden boats were then to be installed inside the pavilion, next to a video documentation of the performance. The artist was forced to readjust his original proposal due to the shortage of budget. Twenty years on, that work essentially became realised for the purposes of this exhibition. 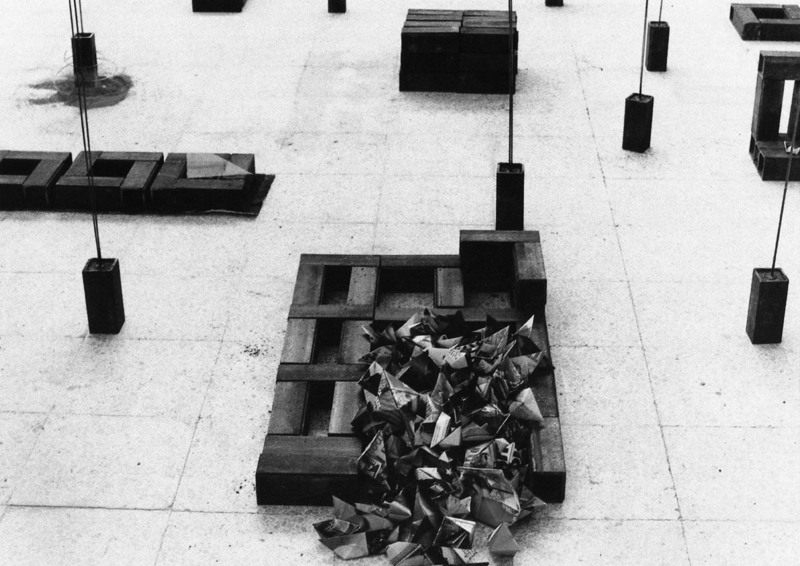 Nikos Kouroussis, Installation View, 1990. 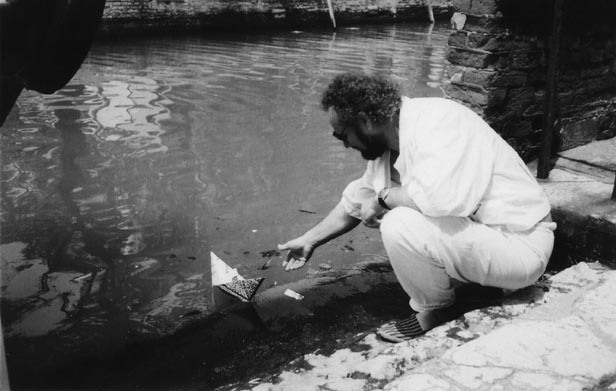 Nikos Kouroussis, The artist next to canal Grande in Venice, 1990.